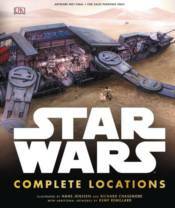 Star Wars: Complete Locations brings together the key buildings, environments, and battle scenes from the Star Wars saga in a single, definitive guide. This updated edition features four new cross-section spreads and a behind-the scenes look at how the artwork is crafted. Packed with more than 50 full-color, intricate cross-section artwork and 3-D maps, Star Wars: Complete Locations is an amazing visual guide into the incredible worlds and locations of a galaxy far, far away. With brand-new cross-section artwork and sneak peek behind-the-scenes pages showing how the amazing artworks are crafted, Star Wars: Complete Locations is the definitive one-volume collection that takes you inside the world of the Star Wars saga.